Pacific Diver, Gavia pacifica, Belyaka Neset. Red-throated Loon, Gavia stellata, Belyaka Neset. Red-throated loon (Gavia stellata), Belyaka Spit. The calls of Chukotka's four loon species are among the most beautiful sounds of the tundra. Pacific loons, Gavia. pacifica, Belyaka Spit. The loons (North America) or divers (UK/Ireland) are a group of aquatic birds found in many parts of North America and northern Eurasia (Europe, Asia and debatably Africa). All living species of loons are members of the genus, Gavia, family. All loons are decent fliers, though the larger species have some difficulty taking off and thus must swim into the wind to pick up enough velocity to become airborne. 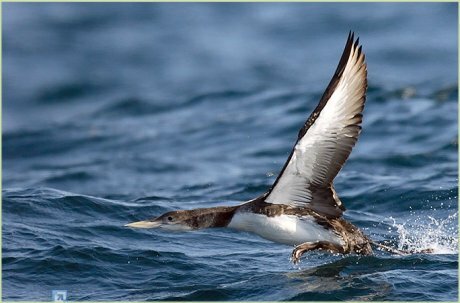 Only the Red-throated Diver, Gavia stellata, can take off from land. Once airborne, their considerable stamina allows them to migrate long distances southwards in winter, where they reside in coastal waters. Loons can live as long as 30 years. Loons find their prey by sight. They eat mainly fish, supplemented with amphibians, crustaceans and similar mid-sized aquatic fauna. Specifically, they have been noted to feed on crayfish, frogs, snails, salamanders and leeches. They prefer clear lakes because they can more easily see their prey through the water. The loon uses its pointy bill to stab or grasp prey. They eat vertebrate prey headfirst to facilitate swallowing, and swallow all their prey whole. 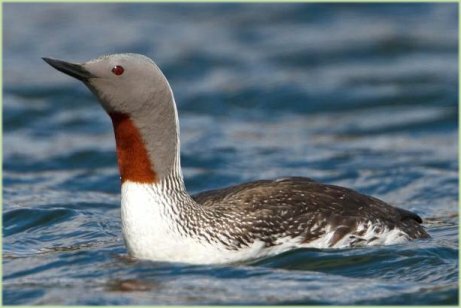 An adult Red-throated Loon in breeding plumage swimming in Iceland. are sometimes eaten as well. A monogamous species, the Red-throated Loon forms long-term pair bonds. The Red-throated Loon has a large global population and a significant global range, though some populations are declining. Oil spills, habitat degradation, pollution and fishing nets are among the major threats this species faces. Natural predatorsincluding various gull species, and both Red foxes and Arctic Foxes, will take eggs and young. The species is protected by a number of international treaties. The Black-throated Loon, Gavia arctica, is a migratory aquatic bird found in the northern hemisphere. name is a compromise proposed by the International Ornithological Committee. this species from all other divers including the otherwise almost identical Pacific Diver. This species, like all divers, is a specialist fish-eater, catching its prey underwater. It flies with neck outstretched. It feeds on fish, insects, crustaceans and amphibians. The Pacific Loon or Pacific Diver, Gavia pacifica, is a medium-sized member of the loon, or diver, family. It breeds on deep lakes in the tundra region of Alaska and northern Canada as far east as Baffin Island, and in Russia east of the Lena River. Unlike other loons/divers, this bird may migrate in flocks. It winters at sea, mainly on the Pacific coast, or on large lakes over a much wider range, including China, Japan, North Korea, South Korea, USA and Mexico. It has occurred as a vagrant to Greenland, Hong Kong, Great Britain, Spain, and Finland. Breeding adults are like a smaller sleeker version of Great Northern Diver/Common Loon. They measure 5874 cm in length, 110128 cm in wingspan and weigh 12.5 kg. They have a grey head, black throat, white underparts and chequered black-and-white mantle. Non-breeding plumage is drabber with the chin and foreneck white. Its bill is grey or whitish and dagger-shaped. In all plumages, lack of a white flank patch distinguishes this species from the otherwise very similar Black-throated Diver/Arctic Loon. This species, like all divers/loons, is a specialist fish-eater, catching its prey underwater. It flies with neck outstretched. The call is a yodelling high-pitched wailing, as well as harsh growls and barks. 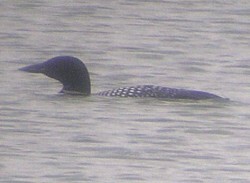 A Great Northern Loon in Minocqua, Wisconsin, USA. The Great Northern Loon, Gavia immer, is a large member of the loon, or diver, family of birds. its current name is a compromise proposed by the International Ornithological Committee. 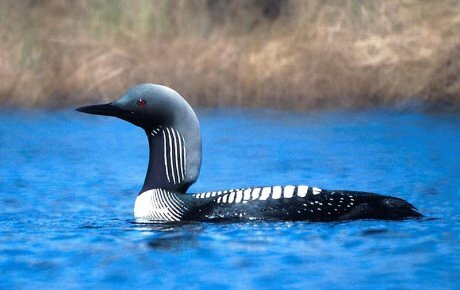 Great Northern Loon is about 81 cm long, has a wingspan of 136 cm , and weighs about 4.1 kg . Breeding adults have a black head, white underparts, and a checkered black-and-white mantle. Non-breeding plumage is brownish, with the chin and foreneck white. The bill is black-blue and held horizontally. 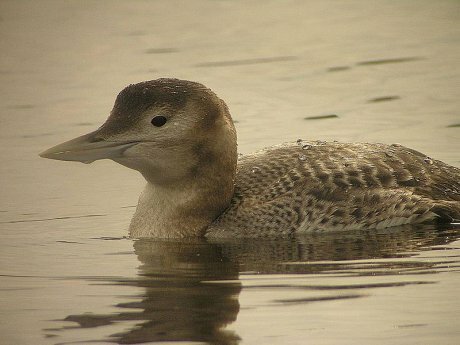 The bill colour and angle distinguish this species from the similar Yellow-billed Loon. 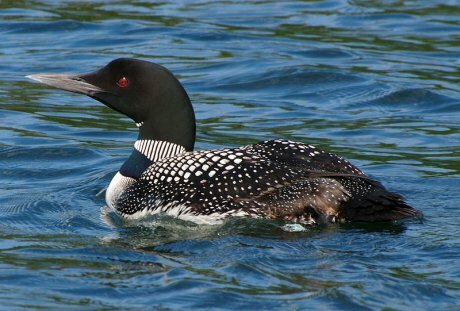 The Great Northern Loon breeds in Canada, parts of the northern United States, Greenland, and Alaska. of Scotland. The female lays 1 to 3 eggs on a hollowed-out mound of dirt and vegetation very close to water. Both parents build the nest, sit on the egg or eggs, and feed the young. as well as in North America. loon or diver family. Breeding adults have a black head, white underparts and chequered black-and-white mantle. Non-breeding plumage is drabber with the chin and foreneck white. The main distinguishing feature from Great Northern Loon is the longer straw-yellow bill which, because the culmen is straight, appears slightly uptilted. wintering range, and has been recorded as a vagrant in more than 22 countries. This species, like all divers, is a specialist fish-eater, catching its prey underwater. Its call is an eerie wailing, lower pitched than Great Northern Diver. in breeding plumage, with a purple gloss on its head and neck. Norway. It has been recorded as a breeding bird in Russia, Canada and the United States. Though it winters primarily to the north of 50° N, its winter range extends south to 35° N off the coast of Japan, and it has been recorded as a vagrant in more than 20 countries, including some as far south as Mexico and Spain. 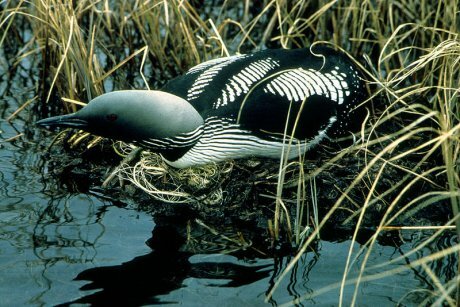 Yellow-billed Loon builds a nest of plant material very close to the edge of the water. The female lays two eggs. The Yellow-billed Loon is a specialist fish eater, though it also takes crustaceans, molluscs and annelids. It dives in pursuit of prey, which is caught underwater.